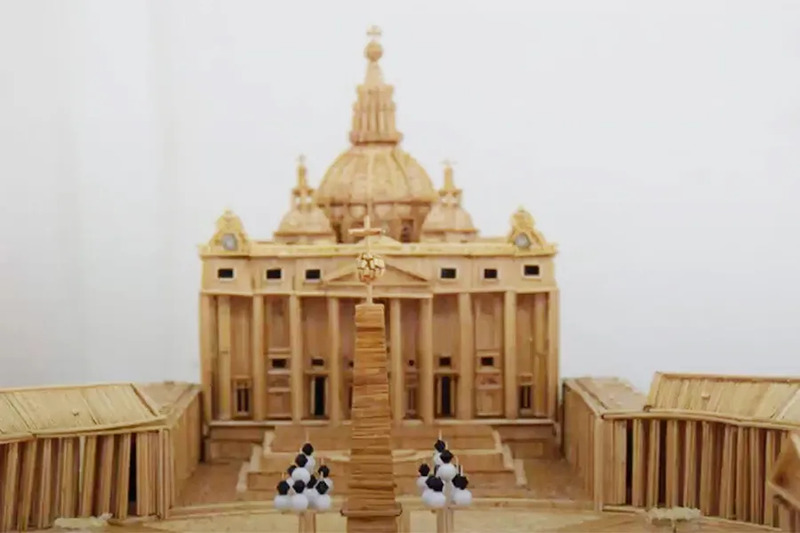 Vatican City, May 21, 2017 / 04:23 pm (CNA/EWTN News).- The Eiffel Tower, the Roman Coliseum, the Statue of Liberty, the Taj Mahal; are just some of the universal monuments that a Colombian teacher makes to scale out of little wooden sticks (toothpicks). One of his recent works is Saint Peter's Square and he dreams of showing it to Pope Francis during the visit the pontiff will make to this country in September. Alberto Antonio Cruz Serna has been building models with toothpicks since he was 12. He currently resides in the town of Puerto Berrio, in the Antioquia district teaches natural science to high school students at the Antonio Nariño Educational Institution, and has built more than 200 artistic creations with his own unique style. Among his works there are also small-scale replicas of Catholic buildings such as Our Lady of Sorrows Parish in Puerto Berrio and Saint Peter's Square in the Vatican. Cruz, who is the father of five children, has displayed his works in a number of cities in Colombia, such as Medellín and Barrancabermeja. He has also won several awards. “What motivates me to build these works of art in toothpicks is the challenge of it. The structure is spectacular. It's not like the wood you cut and set in place. Here it's about joining stick to stick, seeing the lengths and making shapes. The degree of difficulty makes it more interesting,” the 59-year-old teacher told CNA. Cruz revealed that he has never visited the monuments he has reproduced with toothpicks. Nor has he studied architecture or design. He just does research on the Internet and in books on every detail of the artwork he wants to reproduce. His tools? A nail clipper and special wood glue. Cruz commented that his motivation for building the replica of Saint Peter's Square was that in late 2015, he learned that Pope Francis might be visiting Colombia. The Vatican would later confirm the trip, which is scheduled for this September. The construction of the artwork took 17 months. Cruz spent about five hours a day on the project. On weekends, he worked almost all day. The Saint Peter's Square model was made of more than 36,000 toothpicks. It measures about 6 feet long by 3 feet wide. While he was working on this structure, Cruz also made a reproduction of the Leaning Tower of Pisa and the Roman Coliseum. He added that the Pope is important to him because “I'm Catholic, my family is too. And so, who would not want to meet the Pope? If he is the closest representative of God that we have on Earth? For Catholics, who would not want to be at his side? Cruz said that he would like to display the model of St. Peter's Square and the other works of art in Medellin during Pope Francis' apostolic visit. The teacher hopes that the Antioquia political and religious authorities will take an interest in his work and he will have the opportunity to display them. “I'll keep on persevering and knocking on doors,” he said. Cruz said that the governor of Antioquia will soon be visiting the school where he teaches, and he will take advantage of the occasion to show him the Saint Peter's Square, the Leaning Tower of Pisa and the Roman Coliseum. His upcoming projects include the Sagrada Familia in Barcelona, Spain, the Shrine of Our Lady of the Rosary of Las Lajas, and Notre Dame Cathedral.